We’re teaming up with the Calabasas Day Hikers to do a new series of hikes in the Santa Barbara coastal range. In this first hike of the series, we took the longer, scenic route to Gaviota Peak and Gaviota Hot Springs. Our hike leader, Paul Taylor, led us up to two lookout points which provided incredible sweeping views of the Pacific Ocean. After that, we took a steep, rocky trail up past a cool cave and then on to Gaviota Peak where we enjoyed a lunch and some more views. Our last stop of the day was Gaviota Hot Springs where we soaked our tired feet. It was an excellent way to cap off a spectacular day of adventure. Can’t wait for the next hike in the series coming up in two weeks! This hike reminded me of the hike to Telescope Peak in Death Valley, minus the barren desert views. Our intent was to hike up to Smith Mountain and then descend down to Bear Creek, which was about a 12-mile adventure. I arrived a tad late since I couldn’t find the trailhead, but the ladies waited and told the two gentlemen (Don Viejo and David) to go ahead. They were the only two from our small group that hiked up to Smith Mountain. We waited for them at the saddle. When I saw the half-mile stretch to the summit up close, I was glad I decided to wait. The trail was steep like Mt. Baldy’s Register Ridge and involved some bouldering, which I wasn’t feeling up to. Once again, we were blessed with Don Viejo’s presence on this hike. The 88-year-old energizer climbed up Smith Mountain and descended like a champ. He amazes me on every outing and I’m in total awe of his stamina and endurance. He puts 30-something-year-olds like me to shame. But seriously, there is no shame in our group. We hike as a team and the stronger ones are always willing to support the ones who are either in development or recovery. The hike beyond the saddle to Bear Creek took us downhill for about a 2000ft elevation loss over four miles on an unmaintained trail. A chainsaw or machete would have come in handy because we were bushwhacking and climbing over fallen trees. It was quite a challenge. Sections of the trail were also washed out and became very narrow on steep ledges with loose scree. At times, I wondered if the mountainside would crumble right beneath my feet and send me tumbling to my death. Thankfully, no one was hurt during this adventure. I made it to within about a half-mile of the creek when I decided to turn around and head back uphill. I knew the climb back up to the saddle was going to slow me down and we’d be running out of daylight soon. I also noticed clouds gathering and threatening of an impending storm. It was a good thing I turned back when I did because I was very slow going back uphill and the rain started just as I got into my car. Even though I didn’t make it to either of the two planned destinations along this trek, I still had a very fun day with friends enjoying our natural surroundings. During the quiet moments where I hiked alone, I spent some time in prayer and gained a new perspective on some things that were causing me a lot of worry and anxiety and now I have more peace and assurance that all is well. Time in nature is always time well spent. A few weeks ago, I was on my way north toward the Sierra for the fifth time this summer. I’ve organized what I’m calling the Summer Sierra Series, which is a series of some of my favorite hikes in the Sierra geared toward people who can cover a great deal of distance and elevation, but not necessarily speed. I had gotten so used to being left behind on hikes with groups and always the last one to finish that I had decided to hike on my own for a while. I spent the last two years making adventure trips to the Sierra, sometimes on my own, sometimes with company, but I had come to love hiking and camping solo. Earlier this year, I was promoted to assistant organizer of a hiking and adventure group. I decided to organize hikes tailored to suit people like me. People who can do big hikes, but need extra time to accomplish the task. I led my first hike in early March in the San Gabriel Mountains and then came up with the idea for the Summer Sierra Series. We started our hikes in Mammoth, California with a day hike to Thousand Island Lake. From there, we moved further south along the Highway 395 to the next hikes in the series. It was on my way to the fourth hike, the Big Pine Lakes, that I had to utilize a little improvisation. I didn’t leave LA until around 8pm that Friday night because I had just started my new job at one of the studios in Burbank and didn’t leave work until 6pm that evening. I had to go home first and pick up a few things, put gas in the car and then I was able to begin the 3-1/2 hour drive to Lone Pine where I was staying. About an hour out of LA and as I was approaching Palmdale, the last stretch of civilization before heading into the Mojave Desert, I realized I had forgotten to pack a very important accessory, my socks. I was going to have to make a stop in Palmdale and pick up a pair as there was no way I could hike 15 miles in those boots without socks. Boots? I couldn’t remember grabbing my boots and then it dawned on me that I also left the boots behind, along with my trekking poles. I was so concerned with making sure I had all my camera equipment packed (because that’s more important to me, obviously) that I completely forgot the rest of my gear. I couldn’t believe my absent-mindedness. While the trekking poles were optional, there was absolutely no way I could hike without boots. The only other pair of shoes I brought were the flip flops I wore at the moment. I had already driven too far from LA to turn around, go home and get the boots, socks and poles. If I had gone back home, I would have stayed there and would have only been able to sleep a few hours before getting up to hit the road at like 3am to get to the trailhead on time. That was not going to happen. It was 9pm, and I knew the outdoor sporting goods stores were all closed at that hour. I first considered Target, and then remembered I had seen hiking boots in Wal Mart a while back when I was shopping in the store. I knew there had to be a Wal Mart in Palmdale, so I plugged it into the GPS on my phone and it led me to the nearest one, only a few minutes away. I used to love shopping in Wal Mart years ago, but now the experience just frustrates me. It’s usually too crowded and you can never just go in there, find what you need and leave. The times when you’re in the biggest hurry is when you end up in the longest line. Shopping at Wal Mart is just not the adventure it once was for me. The boots were fairly easy to find in the store, but they were only available in men’s. I knew I couldn’t walk out of that store without a pair of boots. I tried on a couple of pairs (without socks on) and landed on the Ozark Trail Men’s Bump Toe Hiking Boot. 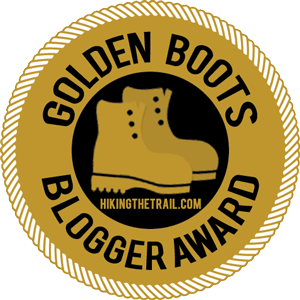 I wasn’t familiar with the brand as I do my boot shopping at REI and Adventure 16 and normally go for the higher quality boots like Vasque, Lowa and Scarpa. I also usually read and compare reviews on boots, but reviews didn’t matter at this point. They could have all had terrible reviews, but I still had to leave that store with a pair of boots. The Ozark Trail Men’s Bump Toe Hiking Boot was pretty comfortable for a cheap pair of boots (I paid $24 for them) so they are the ones I purchased, plus the random thick pair of socks I bought along with them. I knew I was breaking one of the cardinal rules of hiking by breaking in a brand new pair of boots on a 15-mile hike, but I really had no other choice, so I crossed my fingers and just did it. The boots faired very well, actually. I could definitely feel the jagged rocks beneath the soles as these were not the Vibram soles I’m accustomed to. However, for a cheap pair of boots, they were pretty comfy. I barely noticed the one little hot spot on my big toe while trekking past the beautiful turquoise colored Lakes 1-3, but by the time we reached Lake 5 and took a swim, I decided to take my friend up on her offer for some moleskin, just to be on the safe side. We still had about 7 miles to go and I didn’t want to have any issues. At the end of the day, my feet were in good shape and did fine. I wanted to share this story not so much as a product review, but as a way to encourage people out there who may be interested in hiking, but using lack of funds for a decent pair of hiking boots as an excuse to not get out there. You don’t have to go to the stores that carry expensive name brands and spend a small fortune on your first pair of hiking boots. A cheap pair will serve you well, initially. My first pair of hiking boots was a cheap pair that I bought from Sports Authority. They were only a few dollars more than I paid for the Ozark Trail boots from Wal Mart. So if you’re one of those people using this as an excuse to not hike, go down to the local Wal Mart or your discount store of choice and get yourself a pair of boots. The longer you put it off, the more you’ll be missing out on some of the most spectacular adventures like the ones in the pictures below.